Unai Emery claimed Arsenal’s 2-1 win at Bournemouth was a big moment in their season after Pierre-Emerick Aubameyang extended the Gunners’ unbeaten run to 17 matches. Emery’s side took the lead through Jefferson Lerma’s bizarre own goal before Josh King equalised on the stroke of half-time at Dean Court on Sunday. 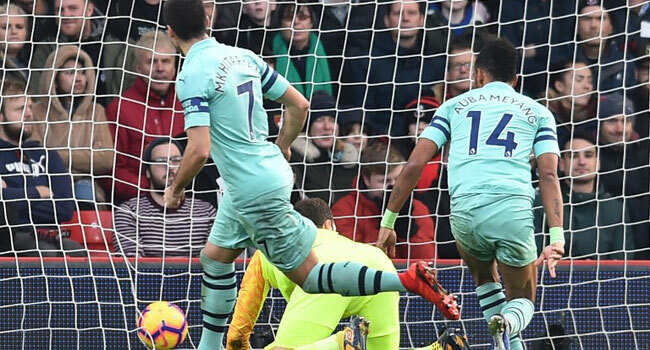 Aubameyang netted his eighth league goal of the season midway through the second half to lift the fifth-placed Gunners within a point of the top four in the battle to qualify for next season’s Champions League. “It is an important result. We knew this is a difficult stadium, a difficult team,” Emery said. The north Londoners have been revitalised since Emery replaced Arsene Wenger in the close-season and the Spaniard passed another test with this victory. After three successive home draws against Liverpool, Sporting Lisbon and Wolves, it was essential that Arsenal got back to winning ways. “Today is 17 matches we haven’t lost, but the last three matches we drew,” Emery said. “We know that is not enough for us, for our objectives. We were speaking during the week and above all in the two days before the match that it was very important. Emery left German playmaker Mesut Ozil on the bench and was without French striker Alexandre Lacazette due to a groin injury.But Arsenal were still strong enough to consign Bournemouth to a third successive defeat as Emery’s decision to switch to a back three for the first time paid dividends. “We are finding our best performance with the system, with the players and with the combination,” Emery said. Bournemouth thought they were ahead early on, but David Brooks was flagged offside as he slotted home King’s through ball. Arsenal took the lead in the 30th minute when Lerma accidently volleyed Sead Kolasinac’s cross past Bournemouth goalkeeper Asmir Begovic as he stretched in a failed attempt to clear. Cardiff are the only other top-flight side yet to hold a half-time lead in the league this season and King’s smart finish with the last meaningful kick of the opening 45 minutes ensured Bournemouth went in level. Aubameyang made amends for his earlier miss, sliding in to score from another Kolasinac cross. Ryan Fraser shot straight at Bernd Leno as Bournemouth chased a second equaliser. Lerma almost atoned for his own goal but struck a post before Leno had to be alert to push the ball behind from Sokratis’ deflection.